Clear Fork’s Jay Swainhart is surrounded by Ontario defenders Saturday night. BELLVILLE — The MOAC boys basketball title race got a bit closer last weekend. Ontario’s 61-52 win Saturday night gave the Colts (15-3, 10-1) their first conference loss of the season. Despite taking a 9-0 lead early, Clear Fork watched the visitors go on a 14-2 run ad take a 14-11 lead. The game was knotted at halftime 28-28. Brennan South had 28 points for the Colts while Jared Schaefer contributed 9 and AJ Blubaugh 8. Shaquan Coburn paced the Warriors (7-7, 6-4) with 17 and Griffin Shaver added 15. Ontario shot 14-of-16 from the free throw line. The Colts visit Loudonville Tuesday night before going to Marion to take on Pleasant Friday night. 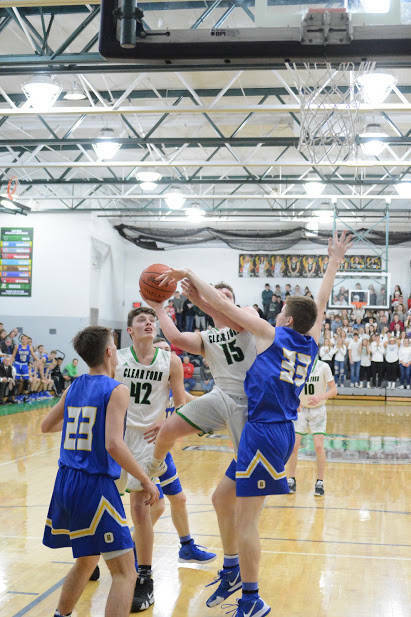 A win over the Spartans, who are in second place, would clinch an outright title for Clear Fork. Pleasant beat River Valley 72-48 Saturday night, thanks to a big second half. https://www.thebellvillestar.com/wp-content/uploads/sites/39/2019/02/web1_710_4759-1.jpgClear Fork’s Jay Swainhart is surrounded by Ontario defenders Saturday night.